Checkline DT-725 Low Cost Stroboscope Reliability Direct, Inc. Your Direct Source for Reliability, Maintenance, Test & Measurement! 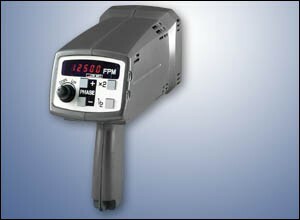 The Checkline DT-721 and DT-725 Digital Stroboscopes are highly stable, industrial-quality instruments for non-contact RPM measurement as well as for inspection and observation of moving parts by ?freezing? or ?slowing down? the action. A ?Kit? option is offered for both models which also includes a carrying case and spare flash tube at minimal additional cost. External Trigger Operation: Suitable for applications requiring external control of the flash rate using a sensor or other input device. An external power source may be required. Optional Complete Kit is offered for both models which also includes a carrying case and spare flash tube at minimal additional cost.